Some kings don't wear a crown. Some famous warriors don't wear a helmet. Not all heroes wear traditional headgear! Sometimes, they support their realm with a trucker hat as a hearty, "Dilly! Dilly!" rings from their mouth! Now, you can be the unconventional hero of the realm by wearing this officially licensed Budweiser hat, which simply says, "Dilly! Dilly!" on the front of it! The Bud Light Dilly Dilly Trucket Hat brings you a magnificent piece of headgear that can accompany you during your trip through the realm! It has a snapback style, making it a one size fits most. 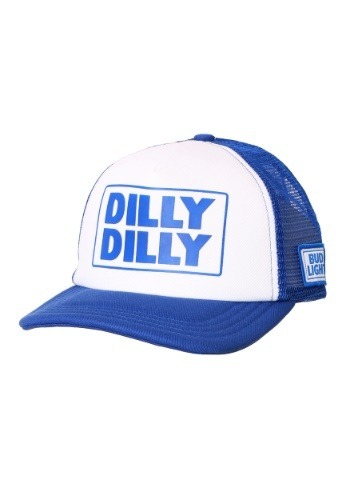 The white front of the hat has a thin layer of padding inside and says the iconic catchphrase in bright blue lettering. The brim is a deep blue and also has a layer of padding. Just toss it on and you'll be ready to crown yourself the king of any tailgate! If you're looking for a new beer hat, then look no further! With a classic and comfortable design, it's the perfect choice for knights of the realm or would-be kings. Once you have it on, everyone will be shouting the renowned hearty cheer—Dilly! Dilly!